The Goal – In Pirates, players are racing to be the first to rescue the Governor’s Daughter who has been kidnapped by the Dread Pirate Roberts. To save her, a player needs to obtain both parts of the map to Roberts’ island, then go there and either pay him 50 doubloons or intimidate him (with 30+ reputation). Each player has their own character with a unique ability and, during the game, players can upgrade their ship’s battle strength and cargo capacity. Also, players have a hand of up to 5 cards which can be battle cards (altering battle strength), missions cards (giving personal goals usually involving sailing to a space and fighting) and crew cards (such as +1 battle strength for the next round). Game Turns and Actions – At the start of each player’s turn a card is turned over which dictates (a) if any of the 4 merchant ships sail along their route with their goods (or if a battleship moves), and (b) from which ports the player can remove one type of good. After this, the player takes 3, 4 or 5 actions depending upon which phase the game is in. An action can be to sail one space or perform an action in a port (buy goods, sell goods, upgrade ship, repair ship, draw a card, etc). Using their actions, players can buy goods and sell them for a profit, fulfil mission cards, or they can attack merchants or other players to steal their goods. Buying and Selling – The economic system is unusual. Each island shows 2 or 3 areas for goods and each area has a set of prices for each different good – each price is both the buying and selling price. When the first area (which has the cheapest prices) is full, the next area is used which has higher prices. So, the more goods currently at a port (regardless of the types), the higher the prices of all goods. In real-world logic, an excess of goods usually makes things cheaper (plus different goods don’t usually affect the prices of other goods) so it’s a bit counter-intuitive in terms of theming. Combat – Combat is relatively simple. Players play a card simultaneously from their hand (or one from the deck for non-player ships) and the value of the card is added to the ship’s strength – highest total wins. If it’s a fight between two players, they take turns playing battle cards after the first card to adjust their totals if they want. Most battles are simple, quick and uneventful; however, if both players have several battle cards, combat can be quite entertaining as positions keep switching. Overall, Pirates offers all the pirate-themed trading and combat activities you would expect; however, there were several issues that I felt held it back. I like how the merchant ships move along their routes, but I would have liked the player moving them to have had some choice, i.e. splits along the prescribed paths so the merchants don’t always move in exactly the same direction or to the same spaces every time. I don’t mind the way prices go up when lots of goods were at a port (just so long as it works as a game mechanic), but the economic system makes it hard to plan what and where to buy/sell because the current player chooses which goods to remove from a (random) port. Also, whilst goods need to be removed from ports so there are opportunities to sell, I would have preferred a less subjective, more predictable and less forced method. Finding goods to sell to make a decent profit can be quite slow which is fine but it means you have almost no choice but to muscle up and gain goods/money/reputation by attacking other ships to make a better income. Again, this would be fine (as the game is called ‘Pirates’ after all) and being defeated in combat isn’t too disastrous; however, it means there’s little choice in the strategies and this makes the game quite repetitive especially as the increasing difficulty level doesn’t add any extra variety. Luck has a large impact on both the cards you draw into your hand, as well as those drawn for combat when battling a non-player like a merchant. To add more control, it may have been better to have 3 separate decks of cards so players could choose what type of card they draw so they could at least choose the balance of card types in their hand. Also, the luck factor affects the movement of merchants and battleships as well as the appearance/removal of goods from ports. In the end, our game lasted several hours which felt too long so that the game became too repetitive and didn’t stand out. Sadly, there’s too much luck and not enough variety or involving game mechanics. 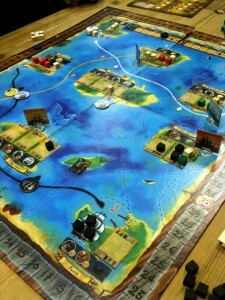 As a result, it didn’t have the tactical simplicity of a Eurogame, or enough detail to be a rich gamer’s game. 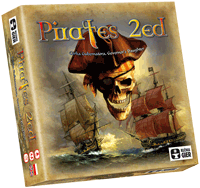 Pirates certainly isn’t a terrible game but it feels like it could have done with some further development to simplify and polish some game mechanics as I think less would have been more. 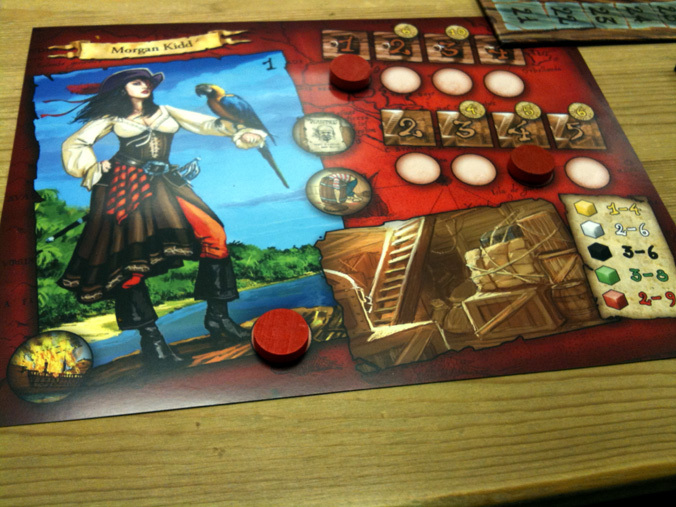 This entry was posted on Tuesday, April 12th, 2011 at 12:54 am	and is filed under Board Game Review, Board Games, Essen Spiel 10, Pirates 2nd Edition: The Governor's Daughter. You can follow any responses to this entry through the RSS 2.0 feed. You can leave a response, or trackback from your own site.